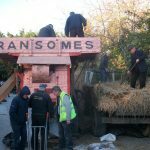 The Ransome’s thresher belonging to John O’Neill was once again star attraction at the old time threshing in aid of ARC House Cancer Support Centre at Corcoran’s Bar Ballinadee on Sunday 6th November. As always Chris, Joanie and family put on a great show and the weather could not have been kinder. 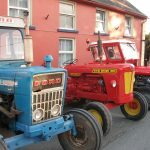 This year there was a change to the vintage run with the day’s events started in Ballinspittle instead of Garrettstown. 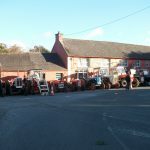 Organised by the De Courcey vintage Club the tractors began forming up at midday outside the CO-OP before departing at 1 PM and travelled in convoy to Ballinadee village, where they lined up outside of Corcoran’s on display for the afternoon. 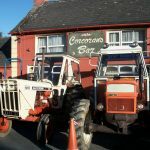 Michael O Sullivan’s David Brown 1410 and Rory Crowley’s Fiat 1000 together made a nice pair with the Corcoran’s sign behind them. 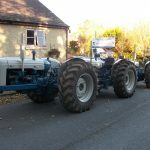 Jim Connolly’s amazing triple Doe Major set-up was the talk of the day and Denis O Reilly’s Roadless Ploughmaster 75 was also a very interesting addition to the tractors on show. 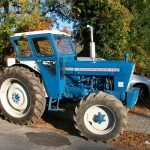 In the yard beside the pub, John O’Neill had his B-450 International lined up to the Ransome’s thresher and rare Claas trusser. Jim Footman soon had the sheaves flying and Richie Sweetnam was feeding the thresher for the evening. 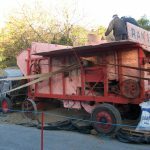 All around the machine there was activity as the sheaves went through on top, grain poured into sacks and chaff flew around the threshing crew. There were several vintage cars on display. Special mention must go to Gus Murphy and his beautiful DKW. Raymond White from Ballinspittle had a display of historic artefacts on show. 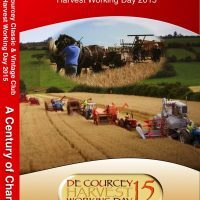 Con Ahern and Pat O Neill had a horse drawn scuffler in action down in the haggard and drew a fascinated crowd when the threshing men took a break midway through the afternoon. Break over! 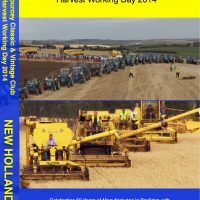 it was back to work in the November sunshine until the stack of sheaves was gone and the grain sacks were filled. 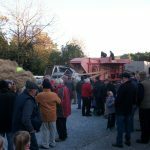 The event was very well attended with a nice crowd in Corcoran’s yard for the evening watching the threshing and enjoying the chat with friends and neighbours. 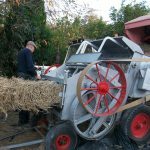 When the work was done the threshing team were called to the parlour for supper. 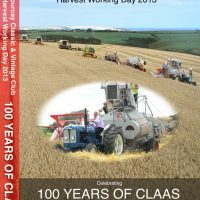 There were some fascinating stories told of bygone days, accidents and blackguarding at threshing’s long ago. After the meal true to the threshing tradition of old, it was out with the musical instruments with another great night of music and song. On the day there was €2,396 raised for ARC House and the Corcoran family would like to express sincere thanks to all who helped especially the local musicians who without fail provide wonderful entertainment at events throughout year. Bill Chambers P.R.O. DeCourcey Classic and Vintage Club. 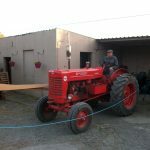 This entry was posted in Events, News and tagged 2016, Arc, Ballinadee, Corcorans, House, run, threshing, Tractor on February 8, 2017 by admin.